Even professional whitening performed by a dentist can lead to painful sensitivity, and the methods used are not natural in the slightest. However, don’t give up hope: if you want a brighter, whiter grin, there is a once-a-week method that can have you flashing your pearliest whites—the natural way and you only need a few ingredients such as baking soda and a 3% hydrogen peroxide. A study from 2008 checked the effect of a toothpaste containing baking soda on removing tooth stain and teeth whitening. One group used baking soda and peroxide toothpaste and brushed twice daily with their toothpaste for six week. The study found a significant improvement in teeth shade score and tooth stain reductions of this group in comparison to the other group that used silica based toothpaste. A review of 5 clinical studies revealed that baking soda is an effective natural ingredient for removing plaque from teeth. The plaque removal effectiveness of baking soda was significantly greater than the non-baking soda products. According to another study, baking soda has antibacterial and antimicrobial properties that can help reduce infections. Since baking soda is alkaline, it neutralizes the acids in the mouth, thus reducing the risk of tooth decay and gum disease. You can also use baking soda as a general kitchen medicine. You may have heard the claim that baking soda is abrasive. However, compared to commercial toothpastes, baking soda is much less abrasive, and therefore healthier for your teeth. Hydrogen peroxide (H2O2) comes in a variety of grades designed to address its different uses for disinfection and sterilization. 3% hydrogen peroxide food grade can help to whiten your teeth if used carefully. That means you should avoid higher concentration and not use it too often. Higher concentrations can damage tooth enamel. A study from 2006 examined the effect of 10, 20 and 30% hydrogen peroxide solutions on human enamel for different periods of time. The research found that higher concentrations of hydrogen peroxide solutions and longer period of time caused more damage to teeth. The researchers recommended to perform tooth whitening using low concentration of hydrogen peroxide, and shorten treatment time to reduce the possibility of teeth damage but reach the required change in color. Another study from 2004 checked various concentrations of hydrogen peroxide gel (5, 10, 15 or 25%) on tooth whitening. It found that a person would need 12 applications of the 5% gel to achieve teeth whitening in comparison to one application for the 35% gel. This means that to prevent damage to your teeth, you will need to use more low-concentration treatments for shorter time in order to achieve your desired teeth whiteness. You can find other uses for hydrogen peroxide in my article “Food Grade Hydrogen Peroxide: Ingenious Uses and Benefits“. Rinse your mouth out well with plenty of water, and you’re done! That’s all there is to it. – This natural whitening method should be performed no more than once per week in order to get a bright smile without harming the protective enamel covering the teeth. – It is recommended that you use a fresh, clean toothbrush your first time trying the method and dedicating that toothbrush specifically to being used for whitening—in other words, don’t use your daily-use toothbrush for your whitening treatment. – According to the National Capital Poison Center, swallowing small amounts of household (3%) hydrogen peroxide is not poisonous to humans. It can cause some irritation and cause a lot of foam in the mouth. If your child swallows some hydrogen peroxide, usually giving a small drink of water or milk is enough to remove the irritation. However, ingesting concentrated hydrogen peroxide (more than 10%) can result in severe injuries like ulcers, internal burning, vomiting, or intense abdominal pain. – This treatment is not recommended for people who wear dental braces, as it would cause uneven whitening that would be noticeable once the braces were removed. – After just one month of use (only four treatments) you should begin to see results in the form of a whiter, brighter smile! Can You Use Baking Soda with Lemon Juice to Whiten Your Teeth? A study published in 2015 found that the acidic nature of lemon juice has the potential to weaken tooth enamel. However, the study also noted that apple juice and orange juice can also affect the integrity of tooth enamel. It is also important to note that the research involved soaking a tooth in an undiluted lemon juice for 7 days. So, when used infrequently, adding lemon juice to baking soda to help whiten your teeth may not have any negative result on your oral health. 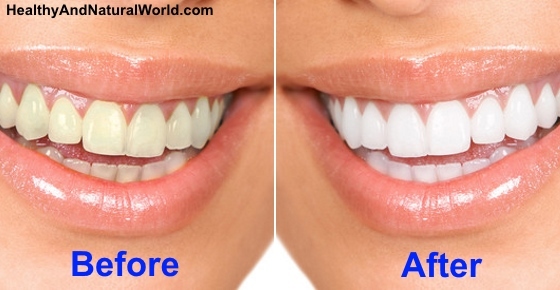 There are 13 other natural methods to whiten your teeth. Try to avoid these 12 foods and drinks that can cause yellow teeth. Learn how to use eggshells to heal cavities. You should also consider using this oil as a toothpaste. No, you need to use baking soda. In any supermarket or grocery shop. It seems this method is good Jenny. I will try very soon.Do I get the immediately results after starting? Any side effects? The results are not immediate. It usually takes about one month (4 weekly treatments) and then you should begin to see results. As for side effects, if you do this treatment too frequently, it will harm the protective enamel covering the teeth. Therefore this method should be performed no more than once per week. Also this method is not recommended for people who wear dental braces, as it would cause uneven whitening that would be noticeable once the braces are removed. One should stop immediately after one month? No. Results vary between different people, so it may take you more or less than that. If you find that after a month or so you got a good result, you can reduce the frequency of the treatment to maintain the good result. Baking soda and baking powder are NOT the same thing and their chemical profile is different. Use baking soda only. It’s my dream to have white teeth but I don’t want to pay for it to be done professionally. I’m definitely looking forward to trying some of your tricks. I’ll let you know how it goes! Seeds and nuts. The abrasiveness of seeds and nuts can help scrub plaque and stains off your teeth while you chew. Plus, they are full of protein and healthy fats. Hello! I had my front teeth fixed and now im wearing crowns (porcelain to be exact) which i dont know the cement used by my dentist on connecting them, can i still use this baking soda + water solution to whiten my teeth? Is still safe? Will my crowns wouldn’t fell off and the cement wont be affected? Thank you! I don’t believe it should cause any problems, but I think it’s best to ask your dentist to be sure. You can buy 3% hydrogen peroxide food grade in the pharmacy. You can use a teaspoon or a tablespoon to measure the quantity. Can I use only baking soda with lemon? Baking soda and lemon juice is also quite common homemade treatment to whiten teeth. A study published in 2015 found that the acidic nature of lemon juice has the potential to weaken tooth enamel. However, the study also noted that apple juice and orange juice can also affect the integrity of tooth enamel. It is also important to note that the research involved soaking a tooth in undiluted lemon juice for 7 days. So, I guess that when used infrequently, occasionally adding lemon juice to baking soda to help whiten your teeth may not have negative result on your oral health. I’ve added your question to the article as probably other people would like to know about it. Baking soda is sold in the supermarket. Can I mix the soda with the toothpaste before using? pls can u use the baking soda with the past everyday? Baking soda alone can be used on a daily basis – many people use their own mixture of baking soda and coconut oil to brush their teeth. However if you combine baking soda and hydrogen peroxide, you need to do it not more than once a week to prevent tooth damage. I tend to think baking soda is powder in form, i prefer using lemon juice, does this mean I should be a mixture to get a paste or different form. You should get a consistency of a thick paste. Can I mix ,d hydrogen,baking soda n paste b4 using it? This is what you suppose to do – see instructions under “Teeth Whitening at Home – The Method” in the middle of the article. am having some white spot inside my teeth, is this soda applicable? I’m not sure what causes the white spots on your teeth, but you can get more information in my article about White Spots on Teeth: Causes and Natural Treatments. If nothing worked out it’s best to consult with your dentist about it. Please Jenny,how many hydrogen peroxide do we have in the chemistries? Which one is hydrogen peroxide food grade? When you go to the pharmacy, ask the pharmacist for 3% food grade hydrogen peroxide. The product label should mention this clearly. You can purchase 3% hydrogen peroxide in the pharmacy. Can I make the mixture from normal concentrated peroxides in the lab, if yes how can I do this? Don’t handle yourself high concentrations of hydrogen peroxide. This can be dangerous. Always use 3% food grade hydrogen peroxide which you can easily buy in the pharmacy. Would the baking soda also make the tongue red if applied? I don’t know as I didn’t experience such a things myself and I haven’t heard about other people that had it, but perhaps some people are more sensitive to this substance, so it’s best to give it a try and see if there is any reaction. Please is this baking soda available in power form in the supermarket?